Spectral Rails - 77% Off! 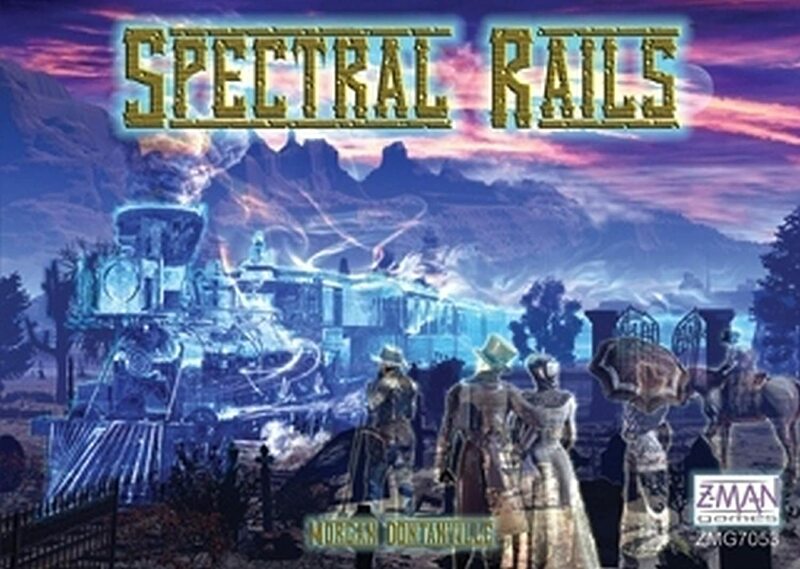 In Spectral Rails players are Engineers of Ghost Trains traveling through the American Southwest. Each player uses their standard set of Ether cards (1-4) to move, picking up souls and delivering them to Ghost Towns. As you move, you expend Ether to lay track behind. Other players can move along on your Ether track for free, but you may never travel along your own Ether. As you lay down more track, your old Ether disperses -- you can pull up your track to clear the way for yourself or to leave someone in the lurch. A portion of the game revolves around managing your discard pile, as you only get half of your ether cards back each turn. But most of the game comes down to proper planning along with timing your movement to take advantage of what other people have left you, while trying to disallow easy passage for others." 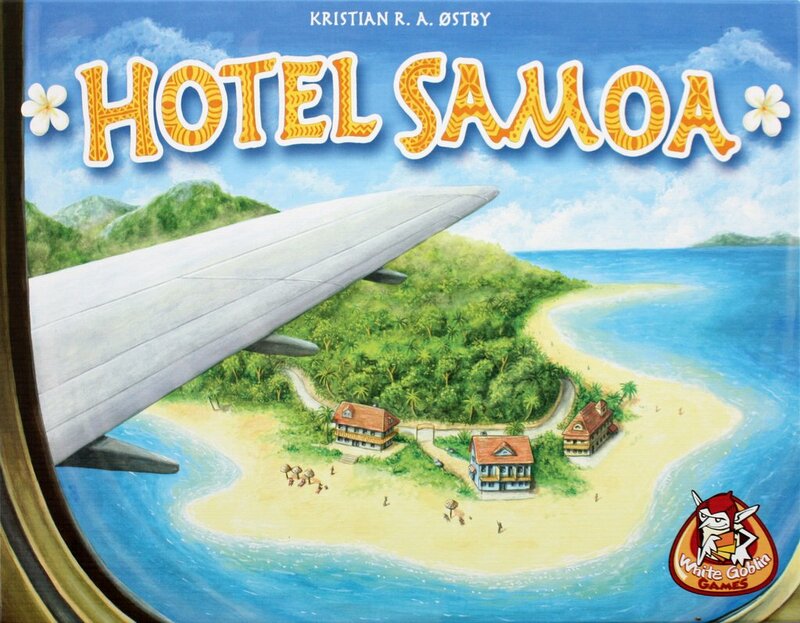 Hotel Samoa - 70% Off! "Samoa. A popular vacation resort, where groups of tourists arrive every week. The hotel owners’ only care is to give these tourists the stay of their life - and of course to rid them of as much money as possible. Each round, new tourists of various nationalities will arrive at the island, and new upgrades in the form of build tiles will be available to buy for your hotel. Players will simultaneously choose one of their price cards to play, which indicates both your bid for building a hotel upgrade, and the price you set on your hotel rooms. The tourists will of course seek out the cheapest hotels first, so you must carefully plan when to demand sky high prices, and when to drop prices low in order to attract the tourists right under your opponents' noses. All the tourists have different personalities and abilities - so be sure to get the ones that benefit you the most. And of course you can enhance your hotel by building extra rooms, a swimming pool, or perhaps a luxury suite? In the end, it's the cash that counts. 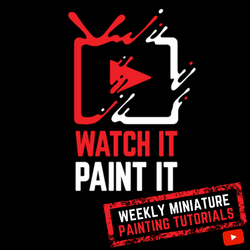 This is a fast and varied game of medium-light complexity, and as most decicions are made simultaneously by the players, the game has very little down time." 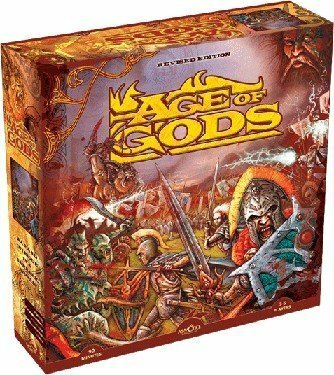 Age Of Gods - 49% Off! "In this game the players are ancient gods that are trying to make their chosen tribes prosper and conquer the land. The twist is that the gods/players don't know all their chosen tribes at the beginning of the game, these are given to them only every other round. 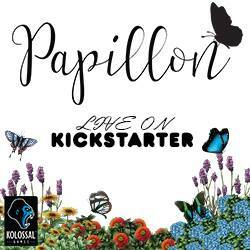 If you read French, check out the link to the official web site in the links section." 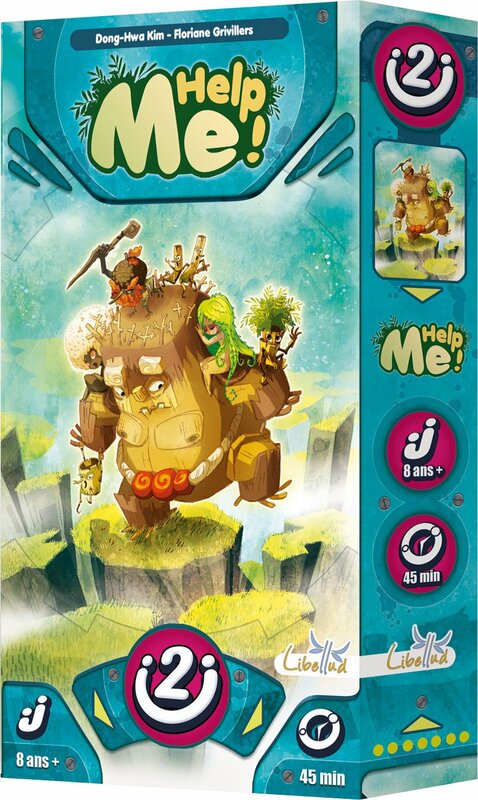 Help Me - 48% Off! "Polar bears, koalas, emperor penguins, cute little panda bears – they all need your help to survive, but alas only one species (and one player) can come out on top in Help Me! The rules include a team variant in which players combine their scores at the end of the game, but don't know which animals their teammates are trying to save. 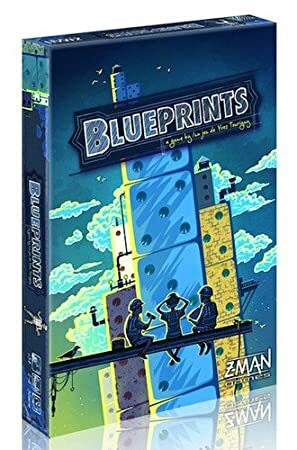 Watch for tears and other clues of sadness when particular animals disappear from the board..."
"In Blueprints, players are architects who must use different colored dice to build three different structures from blueprints, with the dice providing different advantages to you." Onward to Venus - 29% Off! "Onward to Venus is based on the Doctor Grordbort graphic novels from writer/artist Greg Broadmore, with those books being a parody of sorts of the British Empire in the late 19th century, but instead of the race for Africa, we now have the exploitation of the Solar System, which is populated by various natives who resent the Earthling settlers. The game Onward to Venus takes lots of artwork from the books and mixes it together to create an empire-building game set in the Solar System. The core rules are fairly straightforward, and a game can be completed in 90 minutes. The game is played over three turns; in each turn you whizz around the planets and moons claiming tiles. The tiles grant you cards, allow you to build a factory or mine, let you hunt strange beasts, or simply earn you some money. Other tiles allow you to attack other players or add to the crisis level on the planet/moon in question. You have to be careful with crisis tiles as if you let too many build up, bad stuff — Martian invasions, robot rebellions, space pirates, etc. — starts happening." Talisman: The Harbinger Expansion - 52% Off! "As dire omens fill the skies, demons roam the countryside, and plagues ravage civilization, the Harbinger wanders throughout the realm of Talisman, prophesying the imminent end of the world. If you encounter him, he may help you stave off the end of the world and let you peer into the future — or you may be attacked by demon horsemen and stalked by cursed followers. Time is running out. When the Harbinger entered the realm he brought with him a prophecy of impending doom and a series of seven Omens to watch for: when the seventh appears, the end is upon you. Talisman (fourth edition): The Harbinger Expansion features four unique decks of Omen cards, each making manifest a different downfall. In one Omen deck the constellations align, threatening the extinction of magic. In another, the dead rise from their graves and battle to overthrow the living. In another, the time of judgement arrives bringing with it war, famine, death, plagues, and other forms of destruction. In the fourth, the world shatters into many pieces and the terrain transforms unpredictably. New Terrain cards enter the game and alter the landscape, supplanting fields with barrens, deserts with floodlands, and cities with bogs. As doom draws nearer, more and more of the realm is transformed until the seventh Omen appears and all of Talisman becomes a deadly devastation. In game terms, when the Harbinger is in your region, you must draw from the peril-filled Harbinger deck instead of that region's normal Adventure deck whenever you are instructed to draw cards. When you draw an Event, the Harbinger moves into your space, but has no ill effects upon you. However, you move into the space occupied by the Harbinger, you must roll a single die. The result could grant you a second turn, or let you look at the top three cards of any deck you choose. It might force you to populate your space with vicious enemies, treacherous followers, and unpredictable events. Worst of all, your result might cause the current Omen to be discarded, activating the next Omen and hastening the advent of the end times." "In Croak!, you have a queen frog and servant frogs, and while moving them around, and if you land on an opposing frog, you eat it, thereby removing it. If your queen is eaten, you are out of the game. As you move, the tiles you land on can add effects to your movement." Relic Expedition - $35.00 with FREE shipping! 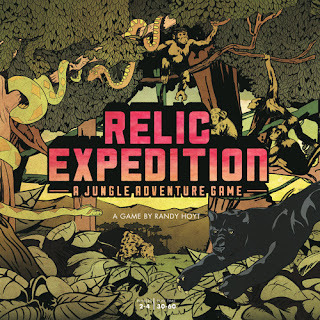 "Relic Expedition is a jungle exploration game with a variable board, hand management, collectible treasures, and dangerous wild animals! If you hope to travel through the terrain and survive the dangers of the jungle to get that treasure, though, you'll also need supplies like machetes, mountain climbing gear, panther traps, tranquilizer darts, vines, and more. You carry treasures and supplies in your backpack, but your backpack space is limited! As the game progresses, you'll have to choose carefully. As you find more treasure, you'll have to make tough decisions about which supplies you have to leave behind."